Andre Gray scored a late winner as Watford defeated Crystal Palace 2-1 at home to reach the semi-finals of the FA Cup. Palace started without Wilfried Zaha, out with a hamstring injury. Watford were on the back foot from the off but it was the home side who took the lead when an error from Vicente Guaita gave Etienne Capoue the chance to side-foot his side into the lead. Gerard Deulofeu went close with two shots from a tight angle on the right, one high and one low, both blocked by Guaita. In the second half, Max Meyer almost equalised with a glancing header that Heurelho Gomes did well to beat away. Michy Batshuayi seized on a Watford mistake to equalise, scoring his fourth goal in as many games against Watford. 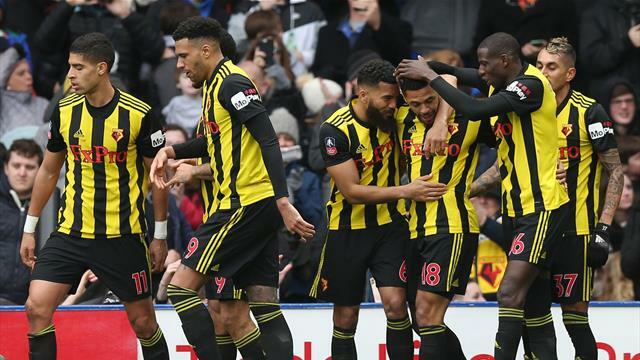 Substitute Andre Gray then put the home side ahead just two minutes after his introduction, against the run of play, and Watford held on for a trip to Wembley. Is Deulofeu that type of player? Before Watford grabbed the winner, Gerard Deulofeu aimed a forearm into the stomach of Luka Milivojevic. The referee let it go, and the commentator argued he was not that type of player. Others on Twitter disagreed, suggesting he was fortunate to have escaped a severe punishment. Gerard Deulofeu (Watford): He was lucky to stay on the pitch after his dig at Milivojevic, but before that he was full of industry, stretching the play for Watford and earning them the set pieces that ultimately told for them to get their first goal. Crystal Palace: Guaita 5, Wan-Bissaka 6, Kelly 6, Tomkins 6, Schlupp 6, Milivojevic 6, Kouyate 6, Meyer 6, McArthur 6, Townsend 6, Batshuayi 7. Subs: Benteke 6. Watford: Gomes 7, Femenia 6, Mariappa 6, Cathcart 6, Holebas 7, Hughes 6, Doucoure 6, Capoue 7, Pereyra 7, Deulofeu 7, Deeney 7. Subs: Masina 6, Cleverley 6, Gray 7. 27’ - GOAL! Watford 1-0 Palace. Capoue scores - The corner is curled in from the right, Guaita can't properly deal with it as he hits a group of players, the ball falls to the ground, bounces to Capoue, and he can side-foot into the roof of the net. 29’ - GUAITA SAVE - Hughes loops a ball out wide for Deulofeu, he steps into the box, shifts it wide of Kelly, and he hammers a high shot that Guaita beats away with a good save. 38’ - DEULOFEU FREE-KICK - Deulofeu flicks a free kick over the ball, dipping it down quickly, and Guaita does well to dive on top of it. 50’ - GOMES SAVE - Masina concedes a corner on the right. Townsend's bouncing corner is met by Meyer, stooping towards the ball, and he forces Gomes into a diving save to his right. 62’ - GOAL! Watford 1-1 Crystal Palace. Batshuayi scores - Mariappa takes his time to control the ball outside the box, allowing Batshuayi to claim it, burst towards goal and fire across the keeper and into the net. 79’ - GOAL! Watford 2-1 Palace. Gray scores - A lovely goal from Watford. Pereyra floats a ball over the defence for Gray's run behind the defence, and he times his shot well, deflected past Guaita.